Originally the house stood on Stone Road, just around the corner from the present location. It was first established as the “Ohio Pelee Club” in the 1800’s. In 1905 the house was relocated to where it stands today. In the 1900’s the house interior held 10 bedrooms, 2 bathrooms, a great room, a kitchen, and a reception area. This was the ideal establishment for the perfect fishing lodge. 1930’s the lodge changed ownership when Hal and Catherine Shaeffer purchased it. It was renamed “The Gillis Lodge” after Catherine’s maiden name. The Gillis Lodge was established to accommodate fishermen and hunters. After sitting vacant from 1969 to 1985 the lodge was purchased in May of 1985 by Victor and Hilda Tiessen. 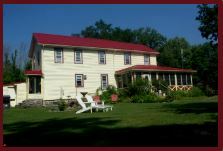 The Tiessen’s renamed the lodge “The Mill Point Lodge”, recalling the Saw Mill built at the south east corner of the island in 1836. This part of Pelee Island is still known as Mill Point. 1992, a local couple, Mary Lou Atkinson and Rodger Poisson were presented with the opportunity to take over operations of “The Mill Point Lodge”. The couple and their family, along with staff ran the lodge for a total of 3 years. 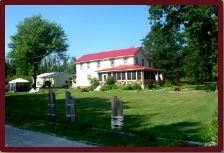 1995 the lodge was purchased by a family from Kingsville and became “The Tin Goose Inn.” The family wanted more than just a lodge or a Bed & Breakfast; they wanted to give their guests an option of choosing from shared accommodation or having a private, more isolated oasis. This was a place for adults to come and get away from it all. In 2002, the family added five units, each approximately 400sq ft in size, all situated on the back of the property; they removed two bedrooms and added four bathrooms to the house, the perfect getaway for anyone. They also ran a four and half star gourmet restaurant.On June 20th, 2009 was my first visit to Canada’s best kept Secret. I had always wanted to go, but never took the plunge, until that day in June. The deal was “one night” and then I had to get back to my crazy, hectic life on the mainland. Almost missing the ferry, I found myself overwhelmed with the whole idea of getting away. Once on the ferry, I instantly became a new person. It was like the island already had a hold of me. The name is a reflection of the island, the unique inhabitants and the magic of being in a place like no other in Canada. As soon as you experience the island, you’ll understand. The name of the inn represents the pheasant that is out there, but hasn’t been found yet, as it is still wandering. I want the Inn to be more than just an Inn. I plan on restoring the original building, creating great gardens and hosting an event each time a guest arrives. “The Wandering Pheasant Inn”. The Wandering Pheasant Inn has become a favorite secret getaway for many new visitors and hundreds of annual repeat guests. This beautiful landmark promises to make your stay on Pelee Island, one that you will remember forever.